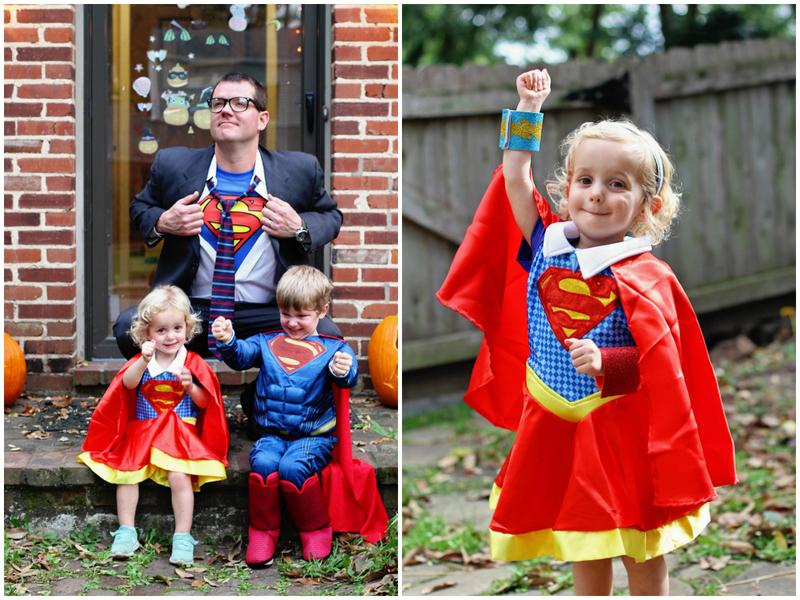 A few months ago, Ryan introduced the kids to the classic Superman movie (with Christopher Reeves) and they've been OBSESSED ever since. 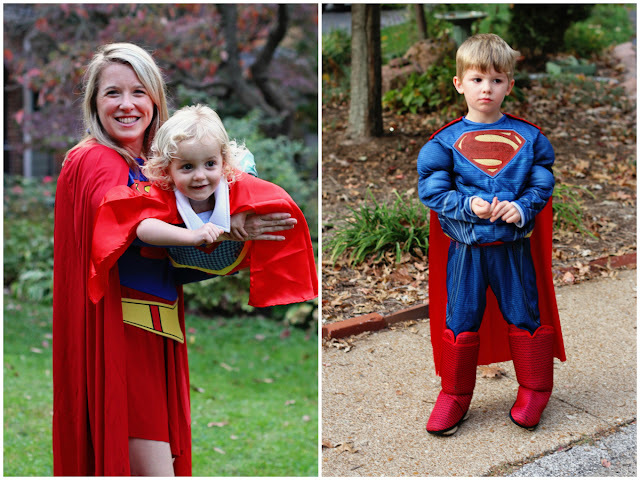 Immediately after watching, they turned their blankets into capes and flew around the house to the soundtrack for days. They watch the movie over and over, never getting tired of it and just as awestruck and excited every time he saves Lois from the falling helicopter. When Superman appears on the screen, Mimmy blushes and gets all flustered and excited, flapping her hands and shouting, "There's Superman! There's Superman!" She's got a major crush! 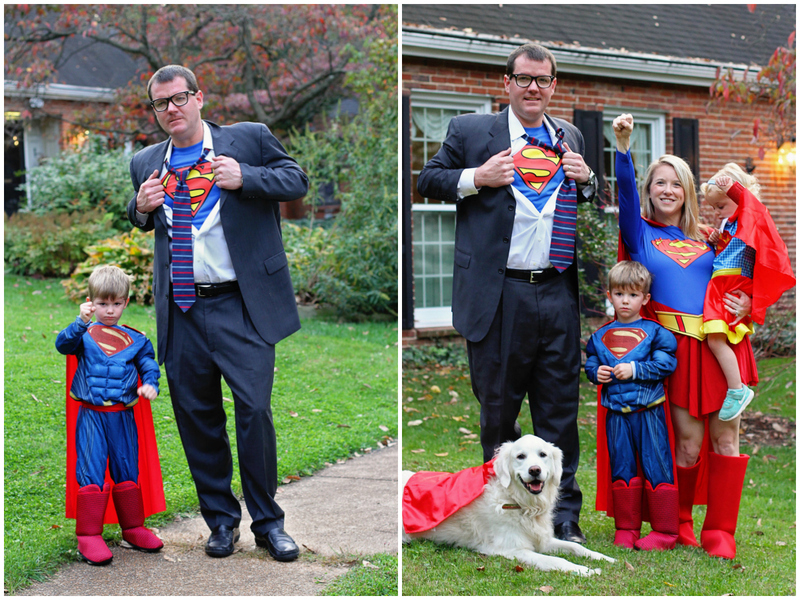 It was no surprise that Mac said he wanted to be Superman for Halloween, and equally adorable when Mim requested to be Superman too. I was going to be Wonder Woman and Ryan was going to be Batman, but Mac insisted that only Superman would do and that everyone (including the dog) MUST BE SUPERMAN. And thus, a super family was born. I hope your Halloween was as SUPER as ours! I love how you all did different takes on Superman! Ryan's is awesome. Happy Halloween! 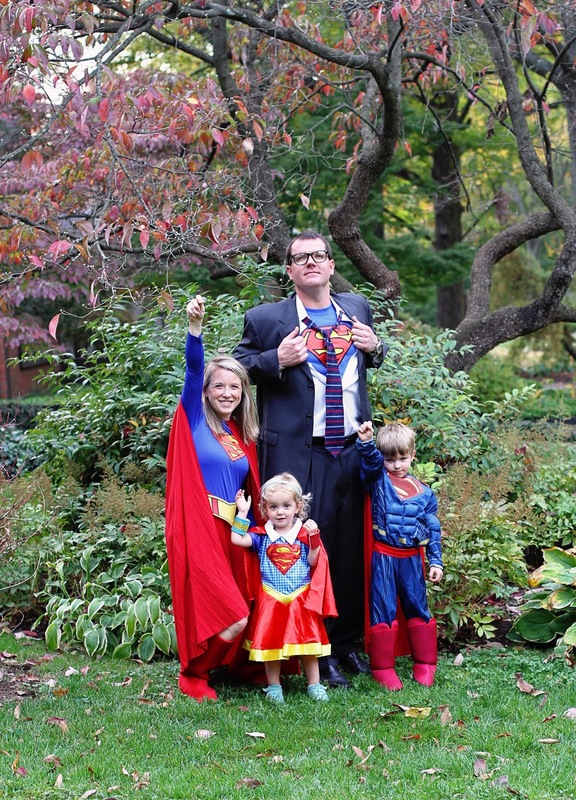 Super hero families rock!! You guys are adorable! I love these costumes! How FUN!!!! And that is SUPER cute! You guys are the coolest! Your kids will always remember this and that is just so fun. 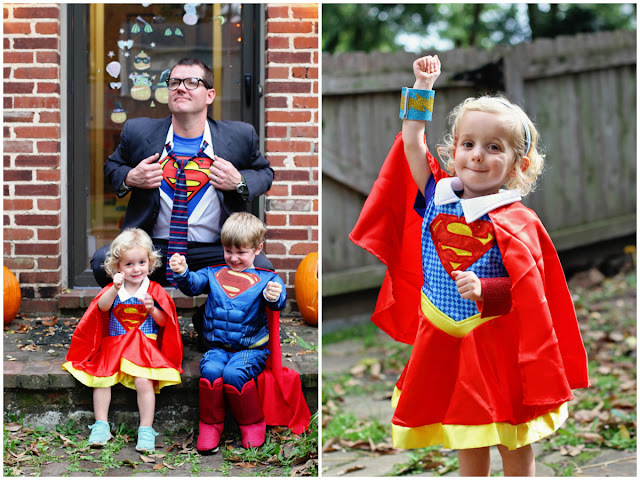 You guys NAIL it every single Halloween! This year is no exception! 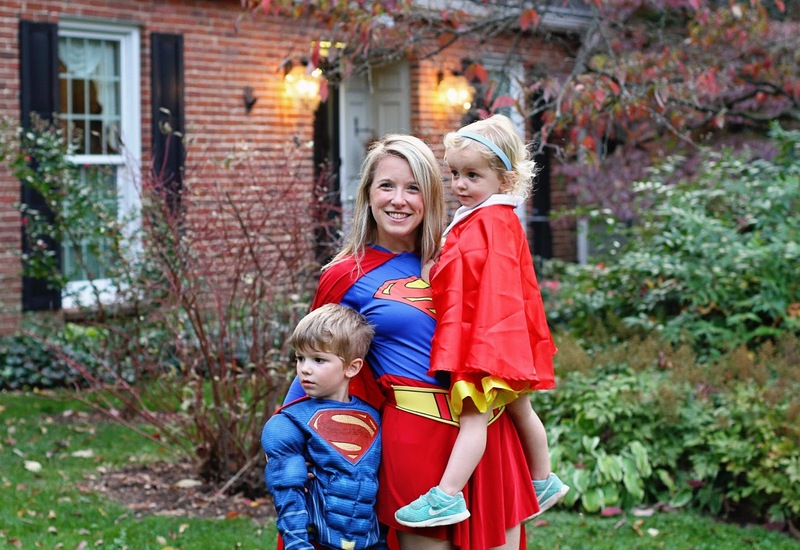 Love, love, LOVE your costumes! You guys are awesome!! 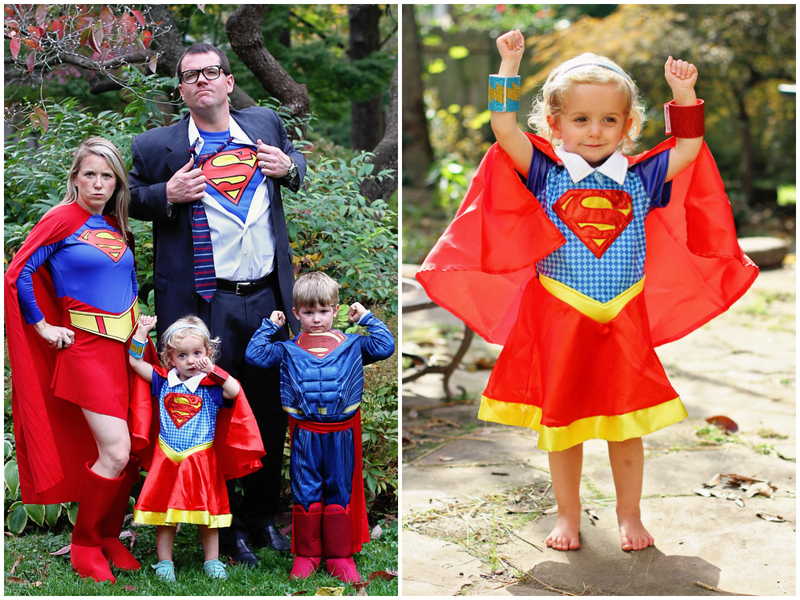 You always have such fun family costumes! Once again, cutest family ever!!! And Ryan gets major points for being so into it! You guys are just far too cute. And the pictures of Mim with her fists in the air - I die! This is literally the cutest thing ever. I love love love that you guys dressed up as a family!!! This is just perfect. That picture of Ryan holding open his shirt like Superman is just perfect. What a great Halloween! You guys are the absolute cutest! And these pictures are awesomesauce. I hope y’all had a wonderful Halloween! Sara!!! These are AMAZING!! You win Halloween pictures of the year. Love, love, love this set!